Savor The Crazy: Will We Run Towards the Blade? Will We Run Towards the Blade? I am processing here, so bear with me. Or read something else by someone wiser. Which pretty much means anyone. How on earth do I reconcile my wealth and ease with the relative poverty and desperation of the rest of the world? By American standards, we are not wealthy. But we are so, so wealthy. I do not worry about clean water. I do not even give a thought to if my children will eat. Our pantry is overflowing, even when people are asking when I am going to the store. I do not worry about someone dangerous coming into my house. I have 42 items of clothing and 13 pairs of shoes. My children have clothes literally spilling out of their dressers. Preston has enough t-shirts with some variation of "Fairview Athletics" to clothe us all well into eternity. But what about the mother of these babies? 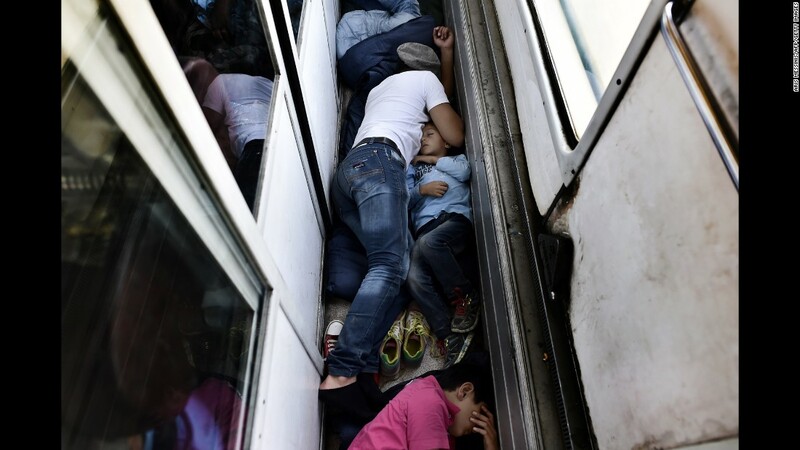 And this person, shielding her child while they sleep on a train bound for hopefully safer lands? I guarantee these parents are worrying about food, water, shelter, safety, their next breath. And I am sitting here, feeling very sorry for myself as I am in a Benadryl stupor, scratching my eyes and cursing the ragweed. And Preston took the girls to IHOP, rather than wrangle everyone into church clothes by himself, which really requires Mommy, where they will undoubtedly come home full of chocolate chip smiley face pancakes. I am trying to process the picture of three year old Aylan Kurdi washed up on a Turkish shore. His parents knew death was a possibilty, but still fled their country, believing death was a better option than what lay ahead of them should they stay. I am trying to reconcile that desperation with the ease of my life. I came across the pictures in this post while looking for something appropriate to show to the girls while we discuss what is happening and how our family can help. There really isn't much out there I feel I can show my 8, 7, and 5 year olds that won't greatly disturb them. I am trying to think how I can explain to them that I recently spent $215 on clothes that weren't actually necessary, and then show them this list and explain we really can only afford to pick one item to send. I am trying to think of ways I can explain this to them without them feeling guilty for the life we are living when I am wracked with guilt myself. This is true not only for me, but for all people. All of them. 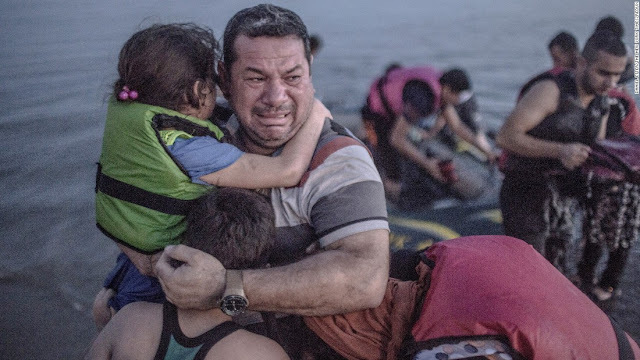 Even sweet Aylan Kurdi. "The Lord is the everlasting God, the Creator of all the ends of the earth. He does not faint or grow weary; His understanding is unsearchable. He gives power to the faint, and to him who has no might He increases strength." So I will stop questioning "why" He gave me and my family this abundant wealth. His understanding is unsearchable, and I don't have to understand His ways to believe they are right. I will instead start asking, "What would You have us do with this wealth You have given us?" And this morning, I was cleaning out a purse and found a gas gift card with $81 left on it. What should I do with it, Lord? If I'm honest, what I really want to do is take that nice surprise money and have an extra night out where I don't have to cook a meal everyone will complain about. 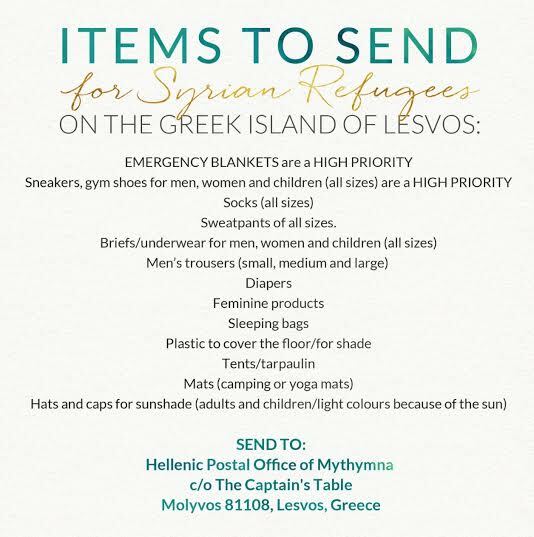 But we are going to take the $81 we won't have to spend on gas this month and go buy as many things as we can off that list to send to Greece. I don't think it's an accident that I found that year-old gas card on the morning I was wrestling with all this. But I believe it is what God called me to do today. From my laptop in my comfy house He knew about way back before the beginning of time. 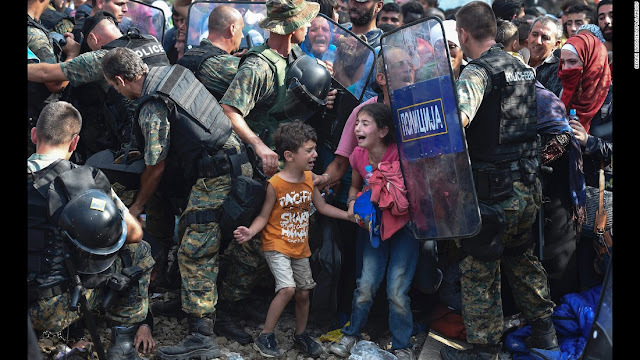 ISIS has promised to use this refugee crisis to infiltrate borders and carry their evil further into the world, which some would use as a reason to stem the tide of refugees. Honestly, I can't fault this thinking. But then the other side of me, thinks, "So what? So maybe we die in a terrorist attack. I know where I'm going. I know where my Beloved is going. I know where my Jesus-loving girls are going. What if they aren't from ISIS but are angels? Or just desperate mothers and fathers, trying to save their children from unspeakable brutality? And I refused to be the hands of Jesus because of a remote possibility they are terrorists?" My pastor used a phrase in his sermon several weeks ago that Preston and I have been repeating to each other ever since: We want to raise our daughters to run towards the blade for Jesus. Whoa. That is heavy. It makes us tear up every time we talk about it, and I am weeping as I type. But should the day come, I want them to know, really know, where their eternity lies and lay down their very life for Jesus' name. I will continue to wrestle with this all my days, I suppose. My life has been one of ease. I am so thankful for that. But so many others live in daily fear. I cannot fathom why. It seems so unfair. But even if I never understand, and I never have answers, I will trust God. After all, at the end of the story, all will be well. "Then the angel showed me the river of the water of life, bright as crystal, flowing from the throne of God and of the Lamb through the middle of the street of the city; also, on either side of the river, the tree of life with its twelve kinds of fruit, yielding its fruit each month. The leaves of the tree were for the healing of the nations. No longer will there be anything accursed, but the throne of God and of the Lamb will be in it, and his servants will worship Him. They will see His face and His name shall be on their foreheads. And night will be no more. They will need no light of lamp or sun, for the Lord God will be their light, and they will reign forever and ever...'Behold, I am coming soon, bringing my recompense with me, to repay everyone for what he has done. I am the Alpha and the Omega, the first and the last, the beginning and the end.'"